A 14-year-old, previously healthy, fully immunized girl is presented to the emergency department (ED) with a 2-week history of left ear pain and discharge. She has just completed a 10-day course of antibiotic therapy, prescribed by her primary care provider, for marked left ear pain and swelling with purulent bloody discharge, headache, and left temporal and facial pain. She denies any history of foreign body in the ears, hearing loss, or fever. The review of systems is not contributory. Her past medical history is unremarkable, and the patient has no known history of allergy. On examination, the patient is a young white girl who is ill-appearing but in no obvious distress. Her vital signs include a temperature of 97.9°F (36.6°C), a regular heart rate of 86 bpm, a respiratory rate of 16 breaths/min, and a blood pressure of 110/80 mm Hg. On examination of the head, swelling and tenderness are noted behind the left ear lobe, with purulent bloody discharge from the left ear. The central nervous system (CNS) examination reveals an alert and well-oriented young girl with a Glasgow Coma Score of 15/15. She is unable to wrinkle the left side of her forehead, she can not close her left eyelid, and the left nasolabial fold is flat and with deviation of the mouth to the right. The cardiovascular, respiratory, and abdominal examinations are all normal. The initial laboratory analysis, which includes a complete blood cell count (CBC) and basic metabolic panel, are normal. Computed tomography (CT) scanning of the brain confirms a left-sided mastoiditis, but no findings to suggest increased intracranial pressure are noted. An analysis of the cerebrospinal fluid (CSF) shows no significant white or red blood cells or abnormalities in the glucose and protein concentrations. A swab of the purulent discharge from the left ear, blood, and CSF samples are sent for culture. She is admitted for suppurative otitis media, mastoiditis, and seventh nerve palsy. Infectious disease, head and neck surgery, and neurology specialists are consulted. Her initial management includes intravenous fluid, pain medications, tympanostomy for drainage and culture, and intravenous meropenem pending the culture and sensitivity results. On admission day 2, however, the patient develops severe left orbital pain, double vision, and the inability to abduct the left eye. The neurologist clinically confirms a sixth nerve palsy, and a request is made for magnetic resonance imaging (MRI) of the temporal bones, as well as magnetic resonance angiography (MRA) and magnetic resonance venography (MRV) to rule out venous sinus thrombosis. The MRI report is obtained. This diagnosis has an anatomical basis. What is the diagnosis? If you really need a hint, look here ... but you don't have to. More satisfaction and kudis by not looking! Hint: Which cranial nerves are abnormal? Where do these all congregate together? What is the significance of the ear discharge? Do the CT and MRI findings point to an aetiology and anatomy? Gradenigo syndrome, also known as petrous apicitis or apical petrositis, is a rare complication of suppurative otitis media, with only a few cases reported (mostly in the otolaryngology literature). The syndrome is a triad of sixth nerve palsy, pain in the distribution of the trigeminal nerve, and otitis media. It was first described by Giuseppe Gradenigo in 1904; the incidence has since diminished with the advent of antibiotic use. In his original description of the disease, only 42% of the cases he described exhibited the classical triad. The neurologic manifestations of Gradenigo syndrome are attributed to the involvement of the fifth and sixth nerves, which are only separated from the inflamed petrous bone apex by the dura matter. The temporal bone not only contains the organs for hearing, balance, and sound conduction, but it also contributes to the cranial vault and zygoma. The temporal bones are situated at the sides and base of the skull and consist of five parts: the squama, mastoid, petrous, tympanic, and styloid process. The petrous portion, called the petrous pyramid, contains the otic and labyrinth. Superiorly, it forms the inferior surface of the middle cranial fossa. Posteriorly, it is bounded by the attachment of the tentorium cerebelli, and together with the mastoid portion it helps to form the anterior face of the posterior cranial fossa. At the petrous apex, there is a hiatus between the tentorium and the petrous that forms a canal for the fifth cranial nerve (Meckel cave). The sixth cranial nerve runs through a notch just below the posterior clinoid process (the medial attachment of the tentorium) and above the articulation of the petrous and sphenoid (Dorello canal). Spread to the sympathetic plexus around the carotid sheath. 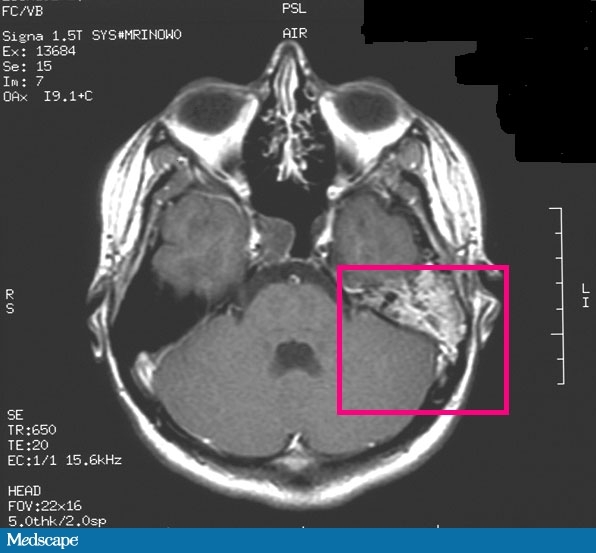 The differential diagnosis of Gradenigo syndrome includes tumors of the petrous apex, such as meningioma, sarcoma, trigeminal neuroma, or metastatic disease. Gradenigo syndrome in children usually results from an infectious etiology. The organisms causing Gradenigo's syndrome are often difficult to recover, and cultures from the middle ear and mastoid or petrous tissue may be negative; however, common organisms recovered include Group A Streptococcus, pneumococcus, Staphylococcus, Pseudomonas aeruginosa, and Mycobacterium tuberculosis. 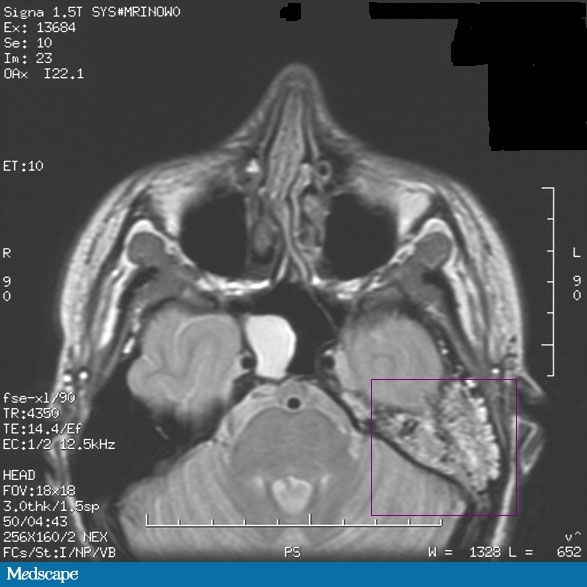 The evaluation of a patient with suspected Gradenigo syndrome should include neuroimaging. A reasonable initial imaging modality is a CT scan of the head with high resolution to provide detail of the petrous apex, as the test is widely available and can identify abnormalities in bony anatomy. MRI is superior, however, for demonstrating the CNS anatomy and meningeal enhancement, which makes it the ideal test to diagnose Gradenigo syndrome. MRA and/or MRV may be useful in evaluating sigmoid sinus pathology. Treatment of Gradenigo syndrome must be initiated immediately. The underlying infection must be addressed in order to prevent further spread, complications, or permanent abducens nerve injury. The advent of the antibiotic era has facilitated the conservative management of a select cohort of patients with apical petrositis. It is now generally advocated that patients be treated with high-dose, broad-spectrum antibiotics and less-aggressive surgical procedures. Surgical treatment involves a minimum of infectious decompression with myringotomy and ventilation tube placement. Tympanocentesis should be performed to allow for culture-directed intravenous antibiotic therapy. In patients with cranial nerve palsies, steroids have been used to speed recovery by reducing inflammation, edema, and nerve compression. The MRI of the patient in this case showed fluid collection in the left middle ear, mastoid air cells, and the petrous apex, which is consistent with the diagnosis of apical petrositis. This finding, in conjunction with retro-orbital pain, otorrhea, and ipsilateral sixth nerve palsies, led to the final diagnosis of Gradenigo syndrome. Her blood and CSF cultures were negative; however, the middle ear fluid culture showed Stenotrophomonas maltophilia sensitive to trimethoprim-sulfamethoxazole. Her antibiotic prescription was changed from meropenem to intravenous trimethoprim-sulfamethoxazole, and 6 days of intravenous dexamethasone was added to her regimen. The patient started to show improvement on the third day of trimethoprim-sulfamethoxazole and steroid therapy. The sixth and seventh nerve palsies improved slowly, and a decrease in the ear discharge, headache, and left orbital pain were noted. She received both intravenous and oral trimethoprim-sulfamethoxazole for a total of 6 weeks, and she continued physiotherapy for the facial nerve palsy. A follow-up examination showed full recovery, and a repeat MRI a few months later showed full resolution. Gradenigo syndrome should be considered in patients with suppurative otitis media who present with orbital/retro-orbital pain and/or cranial nerve palsies, especially palsy of the sixth nerve. Prompt otolaryngology consultation and initiation of antibiotic therapy are very important in curtailing the serious morbidity resulting from this condition.